I listened to Joe Dassin and Michel Sardou when I was learning French in college. Those old cassettes have become obsolete a long time ago but thanks to the Internet, I am able to listen to some of memorable songs once again. I would be grateful if anyone can help me identify a somewhat bluesy song by Joe Dassin, about rural life in the Midi. The lyrics are about a pair of rabbits that multiply(!) and some tree that gets chopped, and a friend named Toni... All I can remember in French are some words from the lyrics that go.."mais il fait chaud dans notre Midi..."
Thanks for Your enormous work and our pleasure to enjoy Joe Dassin's unique talent that will shine forever. I wanna eat my guts for not knowing French well enough to sing it all. After so many years Joe Dassin is not forgotten and his songs are still with us. I was only two years old when he died but I always remembered the melodies. Thank you Joe! Merci, merci et encore fois merci! 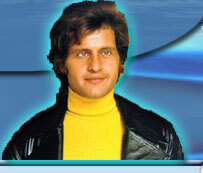 :) C'est site super et Joe Dassin, il ete... super aussi!!! Found your site in google, and it has a lot of usefull information. Thanks. . I just received the Essential Joe Dassin Double CD set, and melancholy entered my life. L'Ete Indien and Le Jardin du Luxembourgh are two of the most beautiful songs ever produced, and Joe's presentations are as close to perfection as any song has ever been. My words are poor to describe what i think about Dassin... anyway, he and his music will live forever in millions and millions of hearts of his fans.. GOD bless his soul! joe is me hero. i love im verry much. i want to ave is babies. ee is the ottest guy i ave ever met. Joe Dassin is my hero! Hottie! I greet from all countries fans. Oraz wszystkich polskich fanów tego wspania³ego wokalisty. Joe Dassin(a) us³aysza³em poraz pierwszy bêd¹c dzieckiem od tamtej pory nieraz przypamina³em sobie jego wielkie przeboje. Niestety nie zna³em wtedy jego imienia i nazwiska, przez wiele lat by³ dla mnie anonimowy. Tak by³o dopuki nie za³o¿y³em internetu w sieci szybko odnalaz³em to co mnie interesuje. Teraz znam dobrze jego nazwisko i twórczoœc. NIESAMOWITY g³os romantyczne piosenki.